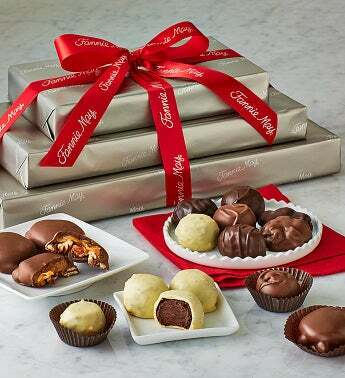 Celebrate in style with Fannie May’s finest chocolates. Choose from the 3 box Traditions Tower or the 5 box Ultimate Tower. The Traditions Tower includes Fannie May’s famous Pixies®, Trinidads® and Colonial Assortment. The Ultimate Tower includes Pixies®, Trinidads®, Mint Meltaways®, Assorted Chocolates, and Peanut Brittle.